My human says she spends every August up to her elbows in Photoshop. That’s because she is usually editing photos for my yearly calendar. And this year is even worse because she is also editing photos for Volume 2 of Rescued. At least it looks like the photo shoots for my calendar are done, or nearly done. One of the last photo sessions for me was a series of New Year’s Eve shots, and what a mess! 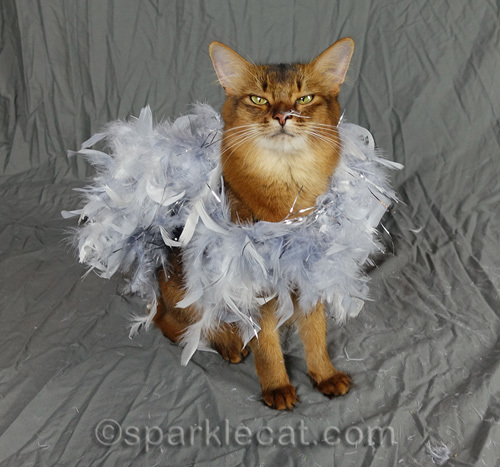 You may remember the outfit and feathers from my New Year’s Eve party earlier this year. Well, in the 8 months since then, moths got into the feathers and created a mess. My human wanted to use them anyway, so if she starts complaining about having to Photoshop all this feather dust, it’s only her own fault. She even wrapped me up in those rotten feathers. Like, I said, what a mess! 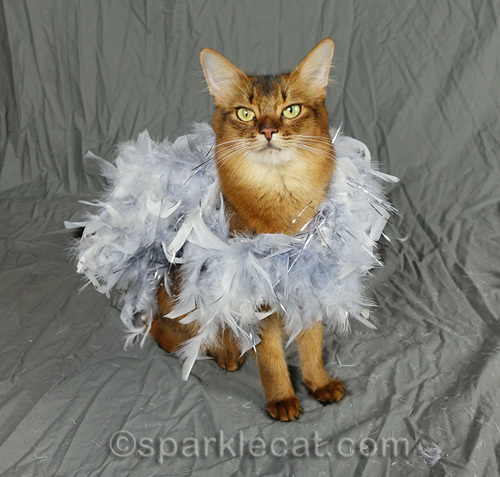 Once we were done with the photo shoot, my human bagged the feathers, but there were still a bunch of them all over the backdrop. So I got to have a play session! I think this photo shoot was the most fun. Ih!Wow! 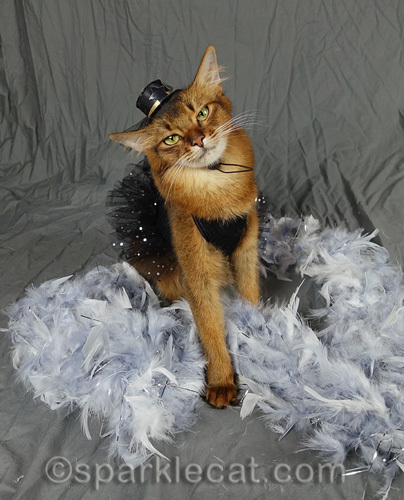 Mes used to loves feathers…that looks like fun! You had better composure with those feathers than we would’ve Summer. For that you deserve some real chicken! Whoa! What moth-eaten feathers. TW is kinda glad we’re not the only one who have moths that get into all my feather toys to the point TW tells people now to send me feather toys. That top photo is very professional especially your pose. Summer, we’re not sure how you managed NOT to attack those feathers yourself!! Summer, we like how there were feathers on your nose. Glad you got to play with them when you were done with the photo shoot. Heehee, you make funny faces in those pictures. It’s very cute! I got a feather toy, but I don’t know if I like it much, it’s on a rattly ball, those feathers taste kinda strange. I hope your’s taste better. Photo session AND play session! Awesome! Mudpie would be going bonkers over all those feathers! Fevvers are the best. WE both agree on our love for fevvers. Those feathers look like lots of fun. You look like you could be performing in Cabaret in the first photo. 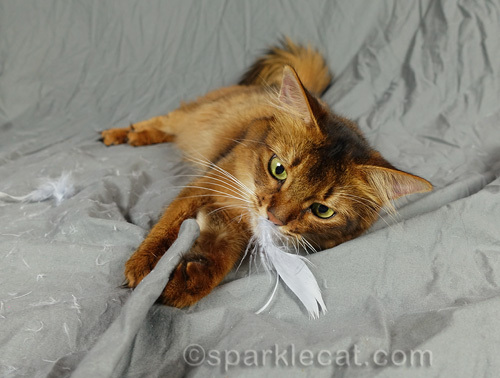 Feathers, now there is a fun photoshoot!! Athough you make mum’s nose tickle with that last one! Ooh, leftover feathers, what fun. Mew mew mew wee LUV yur Feathery fotoss Summer!! That one diss-approving foto made LadyMum laff out loud! At leest you got sum play time…. Haha, you sure don’t look impressed…but you do look very glamorous, Summer! Glad you had a good time with those silly feathers after all. The feather on your nose is terrific. Your so lucky your human has photo shop skills. 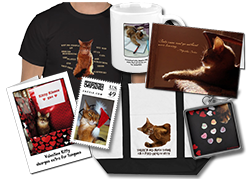 You can see all the dust and stray litter in our pics! I have to say, I MOL when you said “rotten feathers”! They sure do make a mess. You look adorable though. Love the photos. Playtime is always fun. you do NOT look thrilled MOL! The bottom two pictures look very pretty!! It DOES look a bit like a bird exploded … but the pictures are beautiful. Of course, your Mom starts with a gorgeous subject, but she’s got an incredible eye and takes stunning photographs! 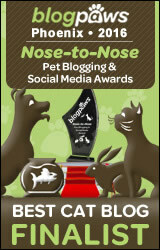 Love these photos………….feathers are fun but they sure do tickle the nose! You look like you’re having a good time…………..and your human did a great job capturing that fun on film! Those feathers do look like lots of fun pretty Summer! MOL! We would have shredded it!